Chart No. 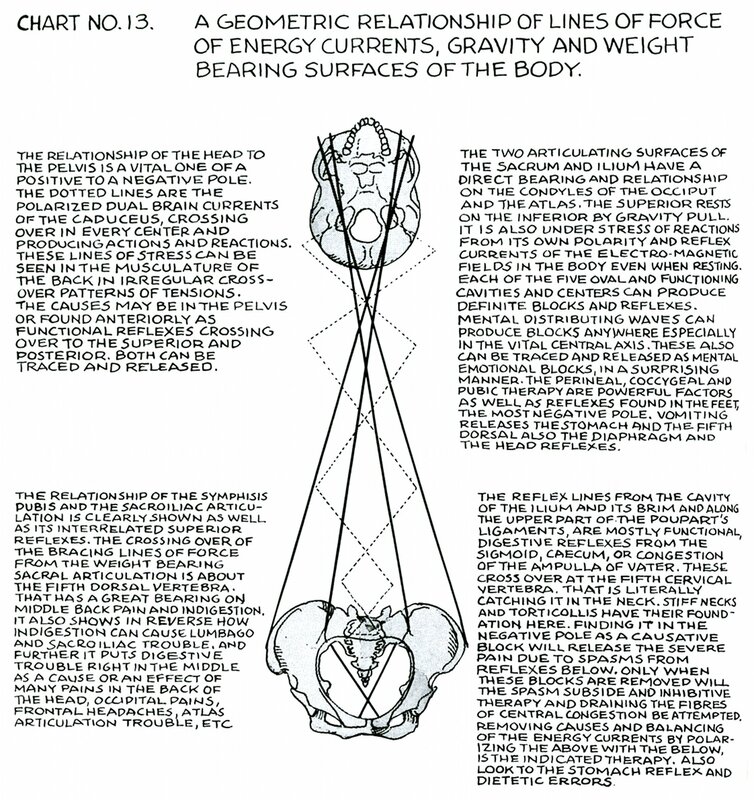 13 - A Geometric Relationship of Lines of Force of Energy Currents, Gravity and Weight Bearing Surfaces of the Body. The relationship of the head to the pelvis is a vital one of a positive to a negative pole. The dotted lines are the polarized dual brain currents of the caduceus, crossing over in every center and producing actions and reactions. These lines of stress can be seen in the musculature of the back in irregular crossover patterns of tensions. The causes may be in the pelvis or found anteriorly as functional reflexes crossing over to the superior and posterior. Both can be traced and released. The relationship of the symphisis pubis [pubic symphysis] and the sacroiliac articulation is clearly shown as well as its interrelated superior reflexes. 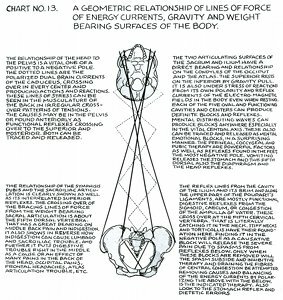 The crossing over of the bracing lines of force from the weight bearing sacral articulation is about the fifth dorsal [thoracic, T5] vertebra. That has a great bearing on middle back pain and indigestion. It also shows in reverse how indigestion can cause lumbago and sacroiliac trouble. And further it puts digestive trouble right in the middle as a cause or an effect of many pains in the back of the head, occipital pains, frontal headaches, atlas articulation trouble, etc. The two articulating surfaces of the sacrum and ilium have a direct bearing and relationship on the condyles of the occiput and the atlas. The superior rests on the inferior by gravity pull. It is also under stress of reactions from its own polarity and reflex currents of the electro-magnetic [electromagnetic] fields in the body even when resting. Each of the five oval and functioning cavities and centers can produce definite blocks and reflexes. Mental distributing waves can produce blocks anywhere especially in the vital central axis. These also can be traced and released as mental emotional blocks, in a surprising manner. The perineal, coccygeal, and pubic therapy are powerful factors as well as reflexes found in the feet, the most negative pole. Vomiting releases the stomach and the fifth dorsal [thoracic, T5] also the diaphragm and the head reflexes. The reflex lines from the cavity of the ilium and its brim and along the upper part of the Poupart's [inguinal] ligaments, are mostly functional, digestive reflexes from the sigmoid, caecum [cecum], or congestion of the ampulla of Vater [hepatopancreatic ampulla]. These cross over at the fifth cervical [C5] vertebra. That is literally catching it in the neck. Stiff necks and torticollis have their foundation here. Finding it in the negative pole as a causative block will release the severe pain due to spasms from reflexes below. Only when these blocks are removed will the spasm subside and inhibitive therapy and draining the fibres [fibers] of central congestion be attempted. Removing causes and balancing of the energy currents by polarizing the above with the below, is the indicated therapy. Also look to the stomach reflex and dietetic errors.